I always love the notion of ‘getting away without getting away’, a short daytrip respite to recharge and refuel. That can include a day in the mountains, an adventure in wine country or something as simple as a drive to Santa Monica to experience some North Italia cuisine. A high end yet casual chain of Italian restaurants, there are North Italia dining locations throughout the country, with local eateries in El Segundo, Irvine and Santa Monica offering a great night of food and drink providing you the opportunity to get away without getting away. At North, the chefs start from scratch to create handmade pizza and pasta using fresh ingredients to craft inspired dishes from the garden, farm, and sea. 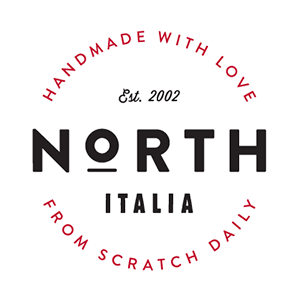 The North menu offers a great selection of antipasti (daily soup, charcuterie, bruschetta), salads, and a main entrée menu driven by both traditional Italian cuisine and lighter fresh fish dishes. The powers that be at North Italia liken their kitchen as a “love letter to Italy”—a place that’ll make you feel like you’ve stepped off a charming side street to discover a culinary gem. I don’t know about all of that, but the Santa Monica North is a wonderful space, big, open and inviting. It’s a great place to enjoy a cocktail or glass of beer or wine. If you’re looking for a handmade pizza, you can’t go wrong with the Bacon & Egg prepared with grilled asparagus, roasted potato, garlic confit and rosemary. This is a deliciously tasty and hearty pie. It’s a great appetizer for a group or a fine dish for one person to absolutely enjoy. 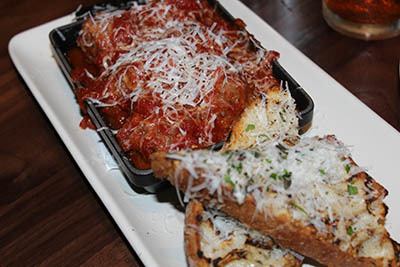 Sharable dishes include the Italian Meatballs with marinara, pecorino, and grilled bread. 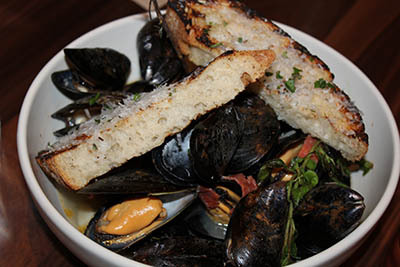 A surefire winner is the Black Mediterranean Mussels with spicy salumi (Italian cold cuts predominantly made from pork), butter, garlic, fresh herbs, served with grilled bread. Delicious. The Bolognese pasta dish came highly recommended. Prepared with traditional meat sauce, tagliatelle noodle and Grana Padano cheese, it was very good but not outstanding. Solid nonetheless. 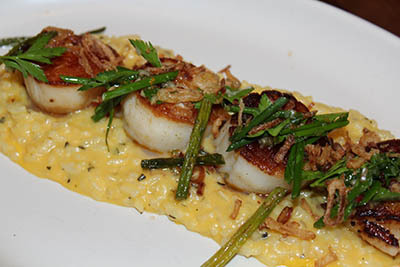 The main entrees that really impressed included the Diver Scallops with sweet corn risotto, asparagus, crispy shallot, and pancetta gremolata. They were absolutely divine. Pair with a nice glass of white and it gets even better. 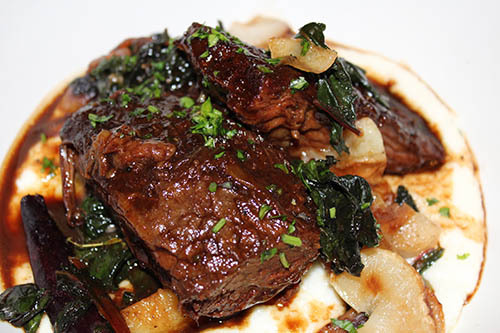 Not to be outdone, the Red Wine Glazed Short Rib with heirloom carrot, Swiss chard, and creamy mascarpone poltena is another crowd pleaser. Pair this with a good glass of red wine and your taste buds will be in heaven. 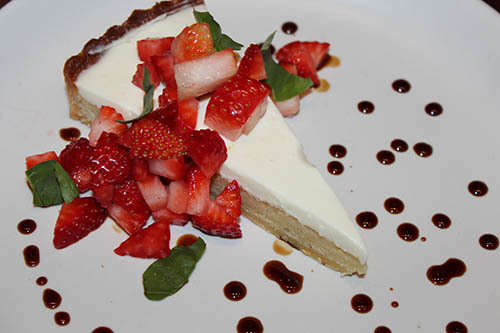 If you save room for dessert, the Strawberry Mascarpone Tart with lemon crema, basil, and almond crust is decadently delicious. If you have more of a sweet tooth, the Salted Caramel Budino with crème fraiche and maldon sea salt will definitely delight. While I wouldn’t consider North Italia to be fine dining Italian, not on par with the Drago restaurants, think Celestino in Pasadena, or Bestia or The Factory Kitchen, it is solid and satisfying cuisine, especially in a casual and comfortable setting in Santa Monica. The setting is sweet, the vibe is chill and the fare is fab. 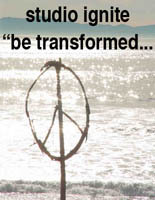 North Italia is located at 1442 2nd Street in Santa Monica. 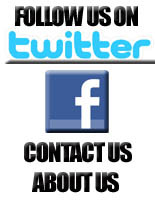 Hours: Lunch Mon-Fri 11am to 4pm; Dinner Sun-Thurs 4pm to 10pm; Dinner Fri & Sat 4pm to 11pm; Brunch Sat & Sun 10am to 4pm. 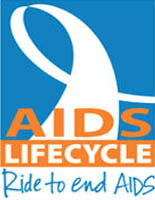 Call 310-382-2460.